The Certified Nursing Assistant, also called a Certified Nurse Aide, enjoys a rewarding healthcare career in Alaska helping patients and clients enjoy the highest quality of life possible in a variety of medical and long-term care facilities. This is an excellent entry-level career choice for people who want to start earning money in 2017 after a short training period or who want to work in healthcare facility before deciding to pursue a nursing or other type of healthcare degree. The Alaska Board of Nursing administers the Alaska statutes governing Certified Nurse Aides and is responsible for certification and recertification of Nurse Aides. There are five steps an applicant can take to ensure a smooth journey towards becoming a CNA in Alaska. CNA programs in Alaska are located throughout the state. The programs are offered at technical centers, medical centers, community colleges, universities and residential or long-term care facilities. There are also several school districts offering CNA training to high school students only, and CNA training is available through the Job Corps for Health Occupations. State-approved CNA programs must offer at least the minimum 140 hours of classroom and clinical training hours as required by law. However, programs are structured differently from school to school in terms of location, enrollment period, age requirements and so on. The most important point to keep in mind is that students should only attend a state-approved CNA program in Alaska. Costs of CNA programs in Alaska range from $1,500 to $2,500, depending on the program chosen. Training expenses include tuition, fees, books, supplies, uniforms, drug screening, background check, health exam and CNA examination. Financial aid is available at many of the schools and technical centers. Some of the organizations and agencies offering financial assistance include the Department of Labor, community foundations, educational facilities, Native American Councils, and state agencies administering Workforce Investment Act or other skills training funds. There are two main ways to get free CNA training. One way is to obtain federal or state grants that do not have to be paid back like a loan. The other way is to work in and train at a Medicare/Medicaid nursing home or long-term residential facility, and the employer pays the tuition and fees. Federal law also says that Certified Nursing Assistants employed by a federally funded skilled nursing facility within 12 months of passing the certification exam can be reimbursed training and exam expenses by the employer. Safe procedures for personal hygiene and grooming, i.e. skin care, bed bath, oral hygiene, patient positioning, etc. This is entry level health services training. However, the Nurse Aide holds a critical position in medical facilities because he or she is the person who has the most regular contact with patients or residents. CNA Certification by Examination is a common path and is initiated by submitting the Application Form Certified Nurse Aide by Examination to the Nurse Aide Registry. The Board of Nursing gives the applicant permission to sit for the CNA state exam. 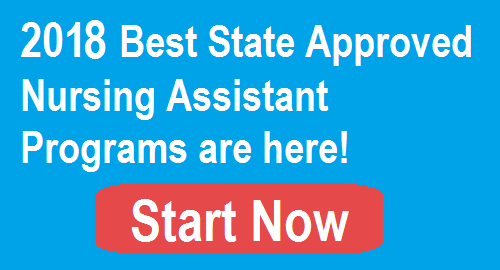 Applicants are eligible to take the National Nurse Aide Assessment Program (NNAAP) certification exam within two years of completing a state approved Nurse Aide training program. People who have a current or lapsed unencumbered nursing license obtained in the U.S. or Canada may certify through testing. There are also provisions made for people who completed one or more years of U.S. or Canadian based nursing education within the last two years, or a U.S. military corpsman or medic training program within the prior five years. People who completed a nursing training program in a foreign country other than Canada can also take the NNAAP exam. Anyone who completes a CNA program outside the U.S. must show proof he or she passed an approved English proficiency examination. The Nurse Aide examination is administered by Pearson VUE and consists of two parts. The candidate must pass both parts of the exam within three tries or will be required to complete a state-approved training program again. Pearson VUE mails the examination results to the Alaskan candidate. If the candidate passes, his or her name is added to the Nurse Aide Registry, indicating all certification requirements have been met. At that point, the applicant has earned CNA certification in Alaska. Some applicants attend a state-approved training program in Alaska while already working in a nursing home. They have up to 120 days to train and get certified, and are only allowed to perform duties which they have learned in the training program. Besides certification by examination, there is another certification pathway called Certification by Endorsement. Briefly, Certification by Endorsement recognizes prior training and does not require taking the exam. This certification process is initiated by submitting the Application for Nurse Aide Certification by Endorsement to the Board of Nursing. There are strict requirements that must be met. The certification applicant must have successfully completed a state-approved Nurse Aide program, possess an unencumbered Nurse Aide certification earned in the U.S. or Canada and complete a competency evaluation. Depending on where certification was earned, it might be necessary to also prove an English proficiency examination was passed with minimum scores. Alaska renews certifications biennially (every two years) during an announced period ending March 31 of even-numbered calendar years. For example, the renewal period in 2016 was February 1 to March 31. If the Nurse Aide gets certified during the biennial period, the certification is valid only up to the March 31 biennial renewal date. To renew CNA certification in Alaska, the applicant must do a minimum of 160 hours of paid work in the United States or Canada during the certification period. If the applicant works less than 160 hours, it is necessary to complete a competency evaluation before the certification will be reviewed. The exception is the CNA who has been certified for less than 12 months before the next biennial renewal period. During the period of valid certification, the CNA needs to complete 12 continuing education requirements. Once again, there is an exception if the CNA has been certified for less than 12 months before the next biennial renewal period. A Nurse Aide with CNA certification that has been lapsed for less than 12 months before the renewal period can renew certification, if able to meet the paid employment and continuing education requirements. A CNA who has a lapsed certification that is more than one year but less than five years can be reinstated by meeting the continuing education requirements and verifying employment for the number of hours that would have been required to maintain current certification for the entire period (160 hours must be within the last 24 months of application), OR by completing a competency evaluation within 24 months of application. There are no U.S. states bordering Alaska. The nearest U.S. state is Washington State which is approximately 500 miles to the south.